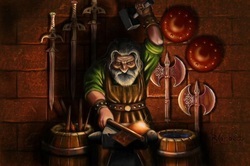 Workers of metal for the Empire, Imperial Smiths are the ones who make the elegant, powerful dwarven armor and weapons. Molding the metal with their bare hands at times due to most smith's Fire element, they create the most beautiful and intricate pieces on the raw metal itself. Crafts made by Imperial Smiths where once fabled throughout the land, and a simple gold goblet at times had enough worth to buy out an entire merchant's caravan. The worth of the craft and the skill of the Imperial Smith where one and the same.